Enriching lives through financial security. FINCA Ventures is an initiative of FINCA International that fiscally supports nascent social enterprises and offers affordable, high quality and life-enhancing products and services for low-income families. WDG partnered with FINCA to enhance their capabilities fully and positively impact lives around the world. 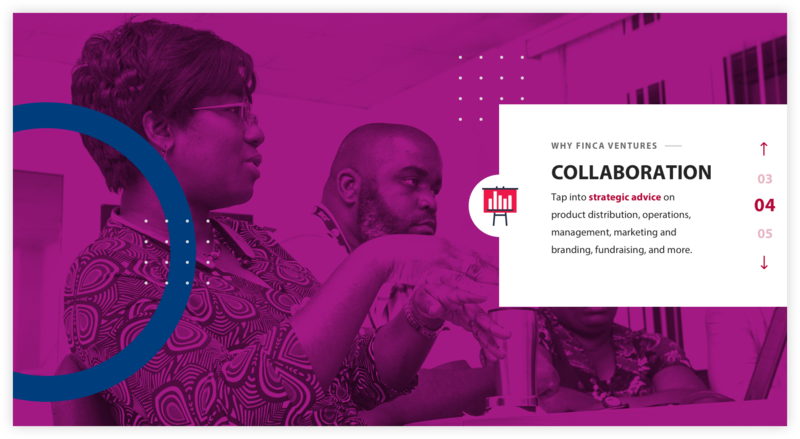 Create a landing page to showcase FINCA Ventures' work and attract investors to their newest initiatives. In order to captivate industry players, WDG created an arrestingly fresh platform. FINCA Ventures has increased donations, improved downloads and grown subscriptions due to the striking site that WDG made. WDG created icons and map imagery for viewers to animate the information provided. Boldly investing in new ideas. The main objective of this redesign was to differentiate FINCA Ventures from their non-profit parent company, FINCA International. WDG strategists had to identify the most effective ways to appeal to the target audiences while creating a completely unmistakable image. WDG ensured that all of FINCA’s calls-to-action (CTAs) were impossible to ignore. The site’s CTAs include downloading resources, signing up, and obtaining new information — our design team applied FINCA’s secondary color palette, giving the site a lustrous, impactful aesthetic. Other tools were put to work to enhance the site as well, including the customized map, icons and slider. Our designers created a gorgeous look for FINCA by using powerful imagery, colors that pop, and effectively fluid organization. It was paramount to showcase FINCA’s current projects, testimonials and insights. 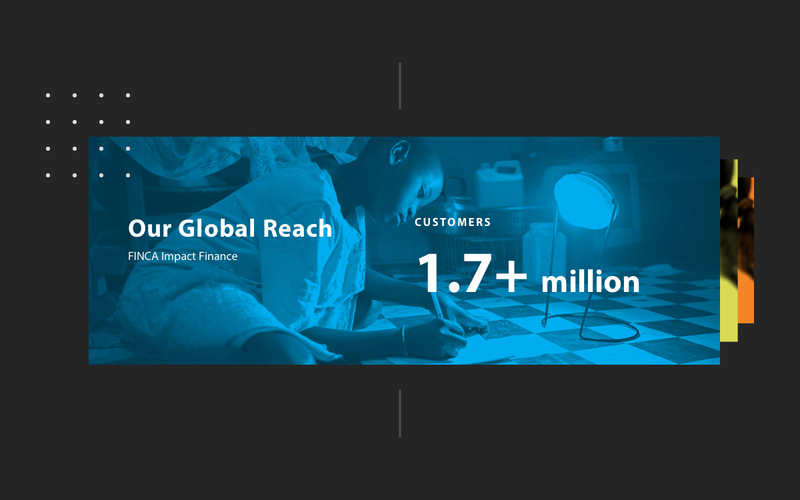 WDG implemented mobile-first best practices in FINCA’s push to maximize their social media game and connect with their global audience regarding safe banking. FINCA highlighted this issue of transformative banking in their Unstoppable Campaign, and what it feels like to be “unbanked”. For their mobile platform, robust metadata, URL shortening, and UTM tracking techniques were applied; while on the desktop, platform-specific buttons were featured along with custom Google events to track activity. In the interest of getting the rest of the world more woke, WDG crafted a marketing campaign landing page focused on “unbanking” — where users pledge to try one day without debit/credit cards, a checking/savings account, ATMs, payment apps or any other digital access to their money. 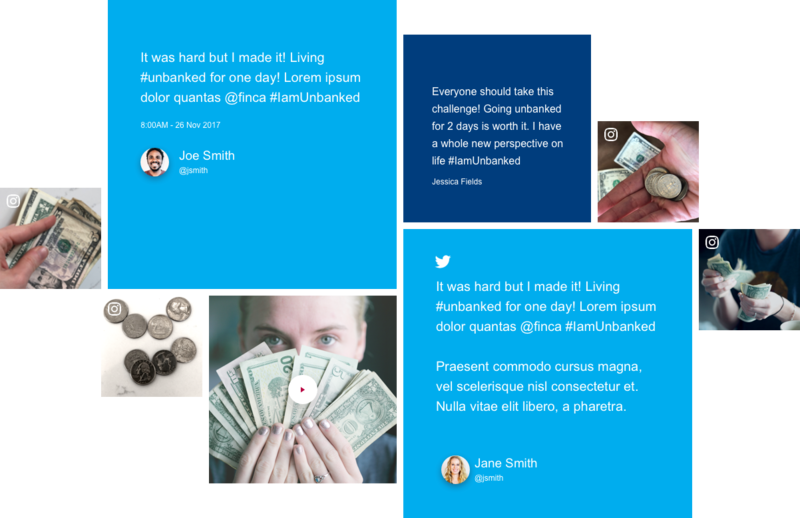 The #IamUnbanked initiative features a professionally produced video, prominent pledge form, a “share your story” feature, and social embeds. It integrates directly with Luminate, an email platform for data capture, while the whole of the campaign sparks audience empathy and clearly conveys the organization’s mission.